The Hip Hop community has been rocked by the untimely death of rapper, visionary, and entrepreneur Nipsey Hussle. He was 33 years old. Not only did he make great music (his latest album "Victory Lap" was nominated for a Grammy), but he was a beacon of light for his Los Angeles community and supporters worldwide. He was a mogul in the making, and young dream chasers could look to his example on how to truly make something from nothing. He showed us how to "hussle and motivate" and taught us that the dream comes with "dedication, hard work, plus patience." In this episode, I have a posthumous conversation with Neighborhood Nip to pose a few questions that young Millennial Dreamers might want to know. To all those he inspired, the marathon must continue. Rest in Perfect Peace, Nipsey Hussle the Great. Your impact on the world is immortal. Have you ever met someone you instantly clicked with? That was the case in my very first conversation with today's guest, Nina. She is an on-air radio personality on multiple stations in multiple cities. You will hear how she got her start in radio broadcasting, some of the surprising challenges she's faced thus far, and why she believes her connections with other women will be the very thing to help her elevate in her career. There was a LOT of laughing in this one. I hope you don't mind. ;-) You can follow her on Instagram @Nina_1913 to see exactly what she's up to. Let's get into it. In today's episode, we sit down with tech maven in the making, Janeya Griffin, the Lead Technology Transfer Specialist contractor for NASA’s Armstrong Flight Research Center. Known as The Commercializer, Janeya is also a strategy consultant, who focuses on helping aspiring entrepreneurs, universities, and small businesses build wealth by monetizing their talents and intellectual property. In the interview, you will hear about Janeya's career in tech transfer, but also how a life-altering childhood experience shaped her perspective, fueled her ambition, and motivated her to join Concreates, a creative agency who's mission is to serve the men and women behind and beyond bars, as Co-Founder and Chief Innovation Strategist. This one is so so good for any creative and is FULL of helpful, need-to-know information. You can follow Janeya on all things social at @JaneyaGriffin. Let's get into it! In the very first episode of 2019, I sat down to chat with serial entrepreneur, Sevetri Wilson. Sevetri is the founder and CEO of Solid Ground Innovations, a strategic communications firm, which she started in 2009 and grew to a 7-figure company. As the ever-evolving business woman, she did not stop there. She later went on to start her second company, ExemptMeNow, a tech start-up in 2016 and has made history as the first Black female tech entrepreneur in New Orleans to raise over $2 million in capital for her start-up. We take a deep dive into her journey in this episode and she shares a ton of advice she's received along the way. You can follow her on all things social here: @sevetriwilson. Let's get into it. There's something about grit. Grit and determination combined will take you further than your talents alone ever could. Kayla Williams is proof of that. Toronto's very own (*Hey, Drake! *) got her start as a weekend news anchor right out of college, but a series of setbacks and detours took her down a divinely orchestrated path towards realizing every dream she wanted to achieve. Kayla's story is one of perseverance, faith, and ingenuity. She gives us all the ins and outs of how she got where she is, while still setting and crushing more goals. Kayla is a living example that you can do it all, just not all at once. Follow her on all social platforms: @kaylamarieto. There is something to be said about a woman who knows what she wants and is not afraid to go get it. That is today's guest through and through. Kandice Guice is a Louisiana-based lifestyle and beauty writer, attorney, and founder of the #MoreThanPrettyCampaign. She joins us today to give us the deets on why she became an attorney, what motivated her to start writing, tips for the everyday career woman, and the launch of her campaign that is already gaining tons of support and traction. We chat and laugh like old college buddies. You can find out more about Kandice's personal brand at www.KandiceGuice.com, and follow her on all things social @kandiceguice. Let's get into it. Gregoire "Greg" Tillery is the owner of the widely popular and rapidly growing wing shop, WeDat's Chicken and Shrimp. Though business is booming, he will be the first to tell you that success came after much adversity. Through it all, he has relied on his faith in God to keep him centered. On this episode, Greg shares the early challenges of his business, what drives him to keep going, and why customer service is the most important part of his brand. For more on his restaurant, visit http://www.wedatschickenandshrimp.com/. He can be found inspiring the masses on all things social @wedatfoodtruck_. Let's get into! In the very first interview on the podcast, Kourtni sits down with professional dancer and choreographer, Kiira M. Harper. Kiira has worked with some of the biggest names in entertainment, including Beyonce, Janelle Monae, Trey Songz, Tank, Drake and Alicia Keys. She shares how she got her start in dance, the moment she knew it would be her career path, and the inside scoop of life as a professional dancer. She also shares how she's carving out her own path and learning more about her purpose. You can follow Kiira on Instagram at @KiiraMHarper. Let's get into the it! For many many reasons, it can be a real life challenge to say no to others (friends, family, coworkers, you name it). But we really do ourselves a disservice when we agree to too many things that ultimately take away from what we need to do for ourselves. Today, we discuss tips to help you say “no” and mean it. "What You Focus On Expands...."
Not sure if you've ever noticed this, but what you focus on expands. Regardless of whether it's good, bad or indifferent. Today, we're discussing how our thoughts create our realities and how we can shift the way we perceive certain circumstances. All of this will help us manifest what we actually want, NOT more of what we don't want. Let's get into it. In this digital age, it's easy to get wrapped up in wanting to create a platform for others to consume our content or learn of our services. Sometimes the focus is more on the platform than the work. BUT when you master the craft, your platform will naturally expand and the audience will come. Let's get into it. After the first episode on "How to Reinvent Yourself," I recieved a message from a friend that outlined the frustrations many feel when thinking through the possibilites. Sometimes there's passion overload. Meaning, you have way too many things you're passionate about and aren't sure what path to travel down. Or, you aren't sure what you want to do, but you know you want more. If you fall into either category, this episode is for you. I discuss some action steps that will help you think it through. Let's face it - networking can be a pain at times, especially if you're an introvert. But if you're looking to get ahead in your industry, grow a business or make new connections, it MUST be done. In this episode, I give 5 quick tips that you can use during your next networking event to help you get out of your head and engaged with complete strangers. 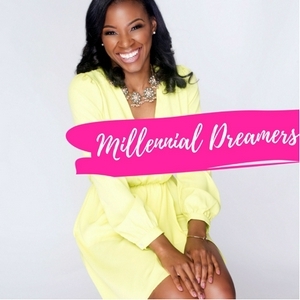 Welcome to the Millennial Dreamers Podcast!